I know what you are thinking: “Enough with the Seattle posts already!” Well, I have plenty more to share, but today’s finds will wrap up a week of posts and finds from my recent trip to Seattle and I will slip the rest in here and there in the coming weeks. I don’t post a lot about restaurants, but while in Seattle I was treated to a lovely dinner at a local institution, Ray’s Boathouse. 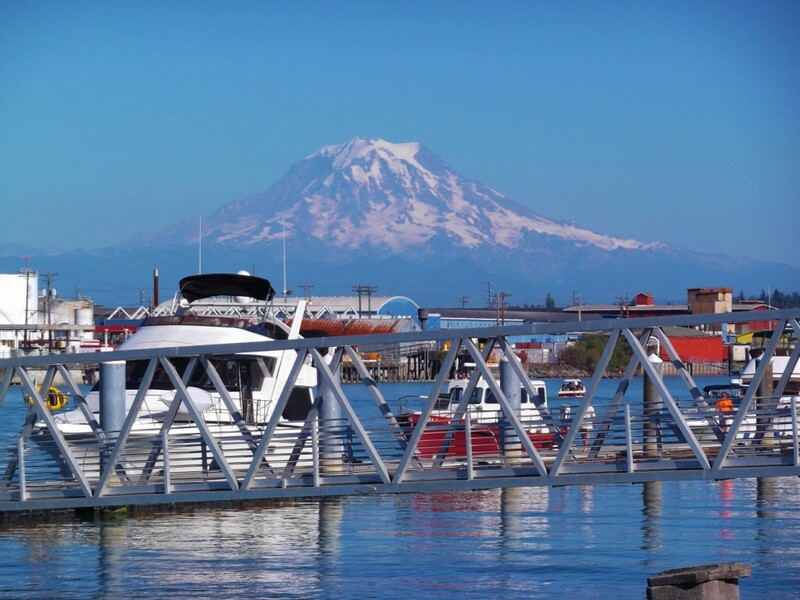 In addition to great food and service, Ray’s Boathouse is right on the water facing west overlooking Puget Sound with the Olympic range in the distance – which is the perfect setting in which to dine at sunset. 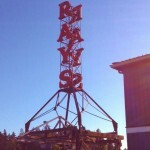 Ray’s Boathouse is located at 6049 Seaview Ave NW in the great city of Seattle, WA. I am tempted to say that there is a Starbucks on every corner in the company’s home city of Seattle, but it seems that there is a Starbucks on every corner in every city these days. Nothing against the undisputed leader in the coffee world, but on my trip I was drawn to a smaller chain of Seattle coffee shops, Tully’s Coffee. Learn more about Seattle’s Tully’s Coffee here. Visit Tully’s Coffee’s online store here. I am a salt collector, so what better memento of my trip to Seattle than some local salt? 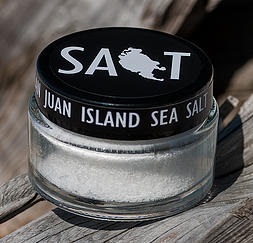 Like the salt from San Juan Island Sea Salt – harvested in the beautiful San Juan Islands north of Seattle and south of Vancouver. 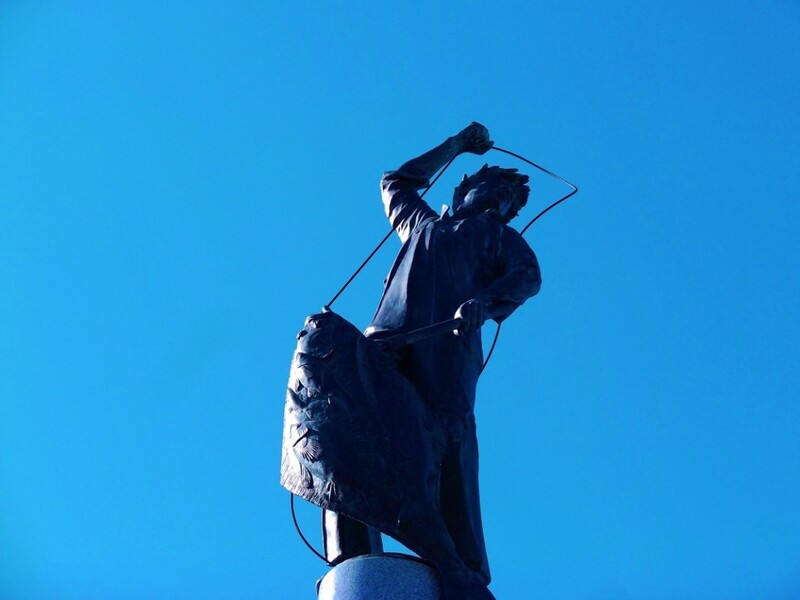 Learn more about San Juan Island Sea Salt here. 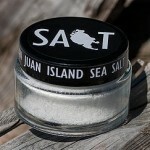 Visit San Juan Island Sea Salt’s online store here. I have posted pictures I have taken from my seat on planes in the past, but I have to say my most recent trip afforded one of the most impressive views I have been fortunate to see. While on approach to the Seattle-Tacoma airport last week, the plane glided through the Cascade Mountains and did a final turn around the majestic peak of the snowcapped Mount Rainier. The photos do not do the scene justice, but it was very cool. In the heart of Seattle’s Pike Place Market you can’t help but notice the crowds gathered around a particular storefront. When you walk up for closer inspection you see the crowds are looking at the cheese-making operations of Beecher’s Handmade Cheese – a purveyor of artisan cheese (and related treats) made and served right on site. 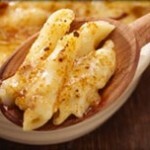 Beecher’s Handmade Cheese is located in the historic Pike Place Market in the great city of Seattle. 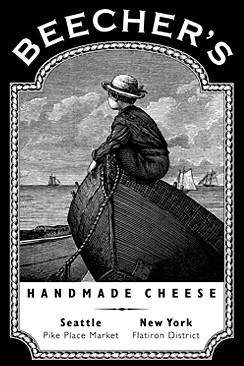 Lucky for us, Beecher’s Handmade Cheese also has an online shop. Learn more about Beecher’s Handmade Cheese – including their NYC location – here. While preparing for my trip to the great Northwest metropolis that is Seattle, I wanted to familiarize myself with the city’s history without having to do too much research (well, reading). My solution was thumbing through the pages of Seattle: Then and Now by Benjamin Lukoff – which brought the Seattle’s past and present together in a way that made me appreciate the place as I walked around the city. I love old pictures of cityscapes and appreciate the glimpse they give us to history. In Seattle: Then and Now, the vintage photos of Seattle are not only a window to the past, they are a path to the future. 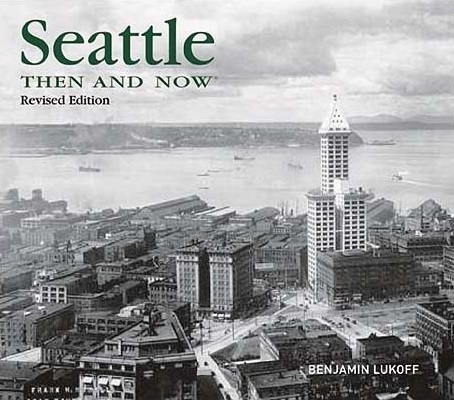 Seattle: Then and Now by Benjamin Lukoff is availalble from Amazon and other fine book retailers. 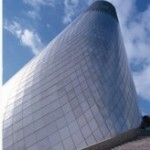 My trip to Seattle was not all pleasure, it was also a business trip. I had to tour the offices of colleagues in the greater Seattle area. 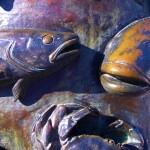 I was please to find one of the offices tucked away in the Fishermen’s Terminal in the city’s Ballard neighborhood. I have to say the offices were very cool – they overlooked the docks where the great fleet of fishing boats call home. I could totally work there. 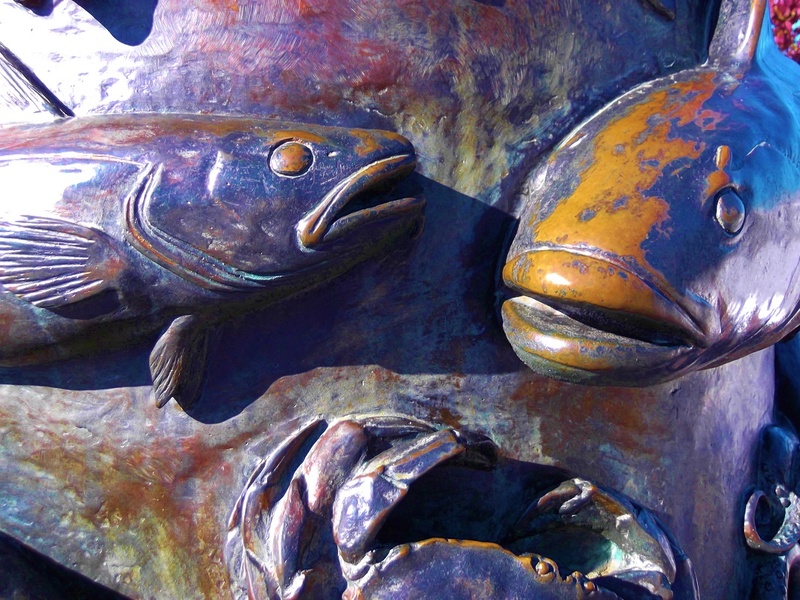 The Fishermen’s Terminal is located at 3919 18th Ave. West in the great city of Seattle, WA. 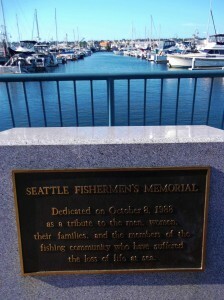 The Fishermen’s Terminal is home of the Seattle Fishermen’s Memorial (above), which honors the men and women who have lost their lives in the profession over the past century. 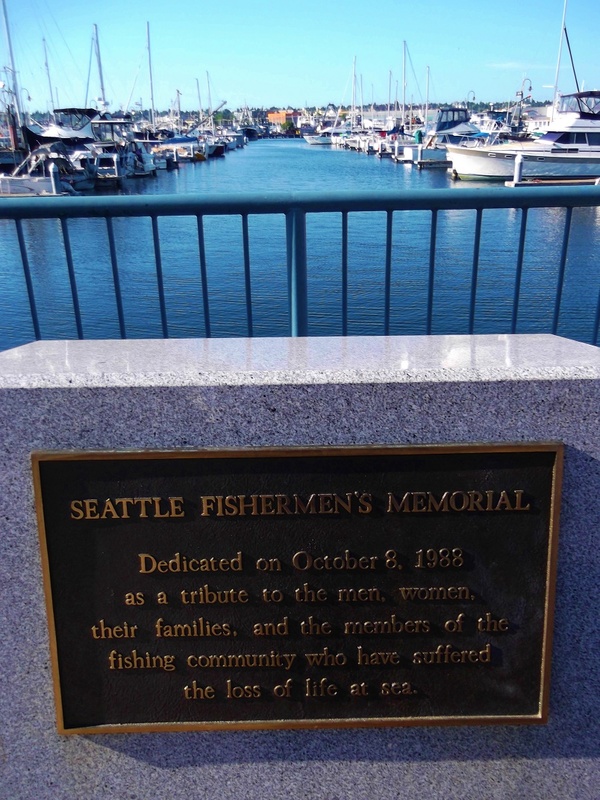 Seattle Fishermen’s Memorial is located at The Fishermen’s Terminal in the great city of Seattle, WA. As a big fan of movies, I often try to scope out the cinema scene in places I visit. It is fun to see a movie in a cool old theater or discover a little-known film before it plays nearby back at home. I am fortunate to live in the Kansas City Metro area where I am told there are more cinema seats per capita than anywhere else in the U.S. – including some great independent theaters. 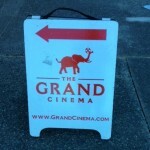 First, on my trip to Tacoma I stopped in to The Grand Cinema, a great independent (a non-profit at that) art house that shows the best in current independent and foreign films. I snuck into a late afternoon matinee of Testament of Youth – which was absolutely lovely and I highly recommend. 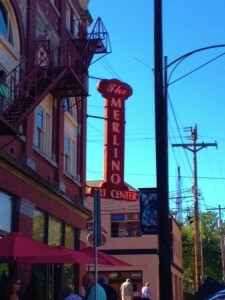 The Grand Cinema is located at 606 South Fawcett Avenue in Tacoma, WA in the historic Merlino Arts Center. Check out the official site of Testament of Youth here. On the other side of the spectrum, I also visited the historic Cinerama in Seattle. Cinerama is a restored single-screen theater that was once the place to see the epic multi-screen spectacles that were part of the movie business’s attempt to compete with television back in the middle of the last century. Now, fully restored with modern amenities, Cinerama shows the latest blockbuster movies on a huge wide screen and it is great fun. I snuck into a mid-day screening of Ant Man to escape the unusually hot Seattle day. By the way, for a big summer release, Ant Man is actually more fun than most and the perfect popcorn flick. 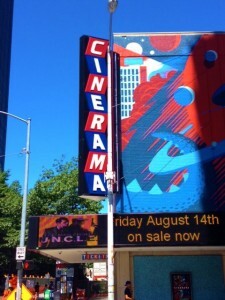 Cinerama is located at 2100 4th Avenue Seattle, WA in Seattle’s Belltown district. Check out the official site of Ant Man here. 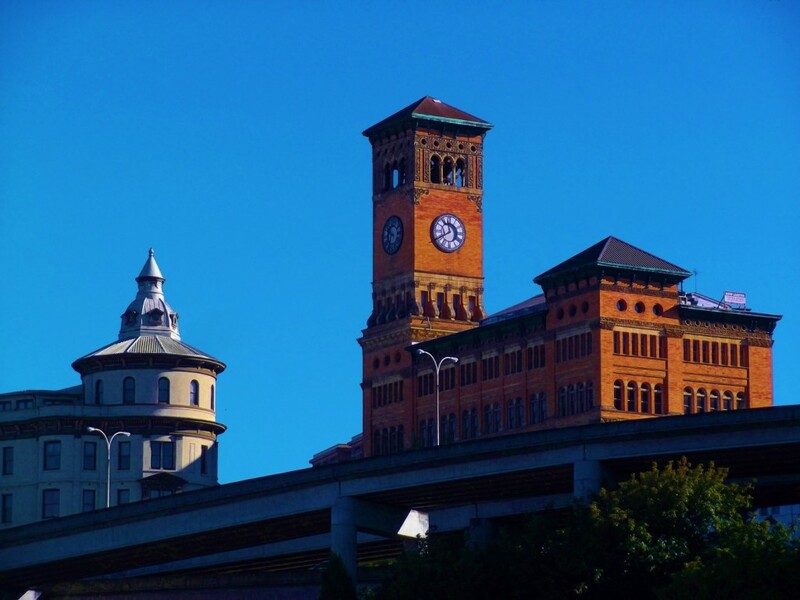 Last weekend on my visit to Seattle, I took side trip to the smaller city to the south, Tacoma, where I had never been before. I was pleasantly surprised to find Tacoma to be a vibrant city with a lot going on including a very happening arts and theater scene. Of course it helped that I was there the weekend of the 23d Annual Tacoma Maritime Festival, which over took the city’s restored historic waterfront and was great fun. 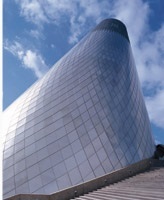 The Museum of Glass is located at 1801 Dock Street in Tacoma, WA. 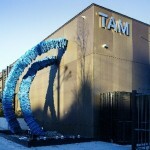 Tacoma Art Museum is located at 1701 Pacific Avenue in Tacoma, WA. 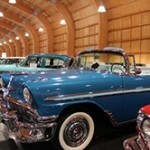 America’s Car Museum is located at 2702 East D Street in Tacoma, WA. 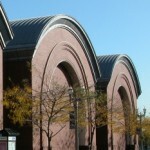 Washington State History Museum is located at 1911 Pacific Avenue in Tacoma, WA. This is not a political statement – positive or negative – it is just a statement: no matter your political stance, don’t you just kind of have to love the Hillary Clinton Action Figure I found from the fine folks at Exit 9? 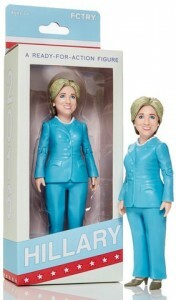 Find the Hillary Clinton Action Figure from Exit 9 here. See all the cool (and I mean really cool) products available from Exit 9 here. 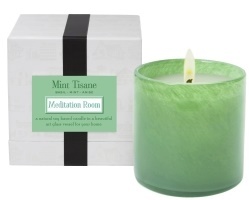 I love highly fragrant candles and there are few better than the Mint Tisane / Meditation Room House & Home Candle I found from the fine folks at LAFCO New York. Learn more about the “luxury items and fragrances” of LAFCO New York here. 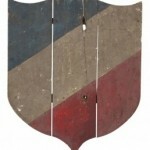 Current Flea items Jayson Home is offering include this gorgeous Antique Cinema Bench, this Vintage Wood Easel, and just in time for next year’s Bastille Day – this Vintage French Wood Plaque (above right). See the entire Flea collection from Jayson Home here. 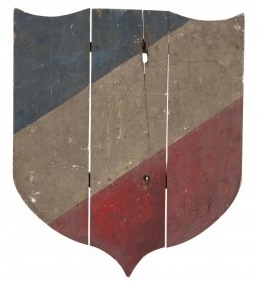 Learn more about Jayson Home and see their entire collection here. Lost Cowboy is powered by	WordPress 5.0.4 and delivered to you in 0.974 seconds using 58 queries.